The Lodges at Artlegarth Self-cateringThe Lodges at Artlegarth - lodge breaks offer you 6 exclusive luxury log cabins with hot tubs and stunning fell views for you to choose from, located on a private seven acre site, offering peace and tranquillity and yet are conveniently located just one mile scenic walk/drive from the village of Ravenstonedale and walking distance from three fantastic village food pubs. 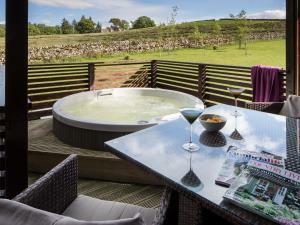 Each luxury lodge is unique, individually decorated and styled with your comfort in mind, well equipped for self catering and the perfect home from home for your luxury hot tub lodge break in the Lake District and Yorkshire Dales National Park. There are 3 brand new for 2018 Sheep log cabins (named after local sheep Swaledale, Herdwick and Rough Fell) to choose from offering superior luxury finishes, real log fires, 6 adult hot tubs with integrated sound systems and exceptional mountain views. Inside individually designed rooms offer total luxury and 3 super-sized double beds 2 of which are en-suite showers and the third bathroom has large shower and bath with access for anyone with limited mobility. Smart TV's in each bedroom and vast open plan living area combined with our new super WiFi system allow you the option to stream films and music, although you may prefer to just enjoy the views through the floor to ceiling glass and play board games by the real log fire which are provided in your log cabin. Perfect for groups to gather when booking one or more lodges on site the open plan living area has a full sized kitchen with a whole range of high specification appliances and there is dining seating for 6 which can be added to to create dining for 18. Each Log Cabin at Artlegarth has lots of space inside and out, you will enjoy the mountain & countryside views from your cabin & the private grounds. 3 stylish bedrooms & the very well equipped kitchens are perfect for luxury self catering. 6 Exclusive luxury log cabins on a beautiful seven acre private grounds, each with its own private outdoor hot tub, offering peace, tranquility and wonderful views, walking distance to three fantastic village pubs. National Park location. Please note log cabins sleep 6 guests, 4 adults as supersized double beds with the option of 1 room that can be made as singles the third bedroom is 2 bunk beds and perfect for 2 children up to the age of 16 Children welcome from any age. The Lodges at Artlegarth offers weekly bookings starting on Friday and sometimes short breaks. Turning off the A685 in to the village of Ravenstonedale, drive around the Black Swan pub and up the hill. At the end of the village as the road bends hard left turn off going straight ahead. Drive over the bridge and turn left signposted for Artlegarth. Drive just under one mile along the road and find the entrance in the stone wall on the left signposted 'Artlegarth Country Lodges'. By Train to the nearest station at Kirkby Stephen on the beautiful settle Carlisle line, then taxi to the log cabin, alternatively train to Oxenholme on the mainline then taxi.